For some demonetisation was a shock, and for some others it was an economic revolution that could drastically reduce black money. It has been 2 years since the Rs. 500 and Rs. 1000 notes were demonetised without any prior notice, affecting the daily lives of millions of people across India. Back then, the government had said that the main target of the demonetisation move was to control the amount of black money circulating in the economy. 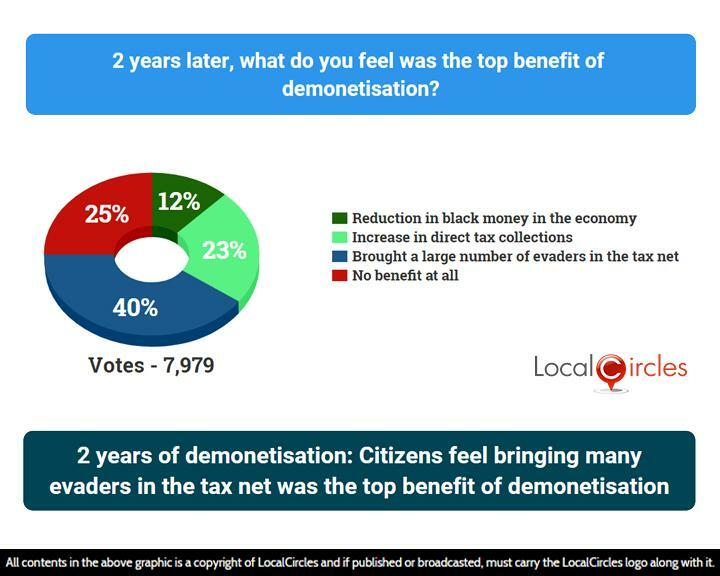 If the citizen pulse via this survey is to be believed, majority of the citizens think that black money is back to full scale and with the 2019 elections coming up, its circulation will only increase. The first question asked consumers that when they shopped in the last 12 months, what percent of their monthly purchases on an average were without a receipt. 37% said it was between 5 – 25% and 18% said it was between 25 – 50%. 39% said it was between 50 – 100% while 6% were unsure. Many consumers who have been out for the festive shopping have reported that the shopkeepers do not give them a receipt when they pay for the product in cash. However, if they pay with a card or electronically, the receipt is given. 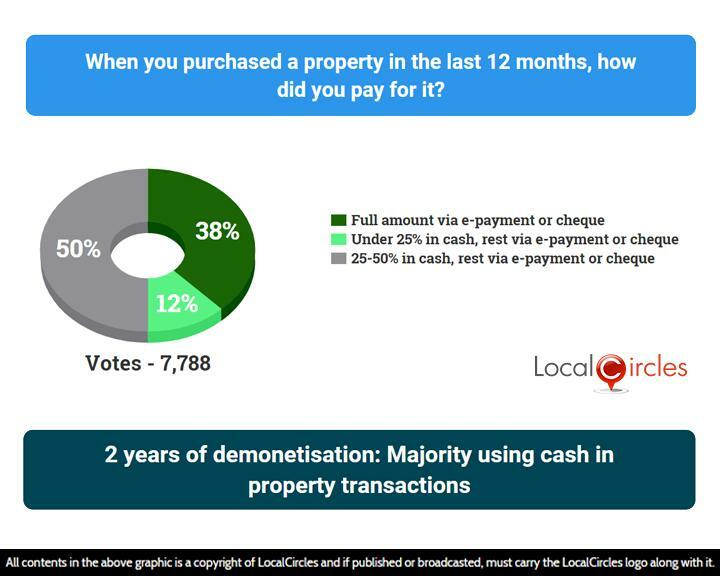 38% in the next poll said that when they purchased a property in the last 12 months, they paid the full amount via e-payment or cheque. 50% said they paid 25 – 50% cash while 12% said they paid under 25% in cash. The use of black money in property transactions was most common and continues to be. Land owners, builders and common citizens all evade taxes by understating the official value of a transaction to evade taxes. According to citizens, while demonetisation had temporarily disrupted the real estate sector and in 2017 several citizens had admitted that the percentage value of black money in a transaction had drastically reduced, citizens are now saying that it has risen in 2018 and back to the pre-demonetisation levels. The Government has been boasting about a 71 percent increase in the number of income tax returns (ITRs) filed till August 31, 2018, when compared with last year. 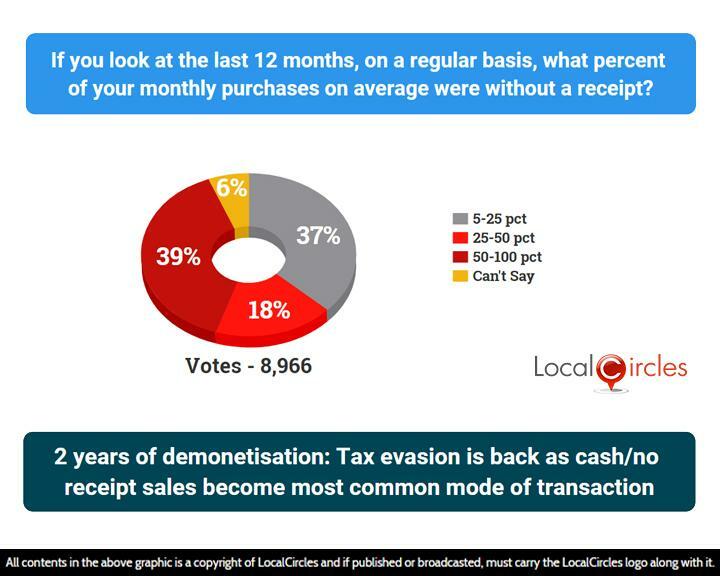 40% in the next poll said the biggest benefit of demonetisation was that it brought a large number of tax evaders in the tax net. Only 12% said it reduced the amount of black money in the economy while 23% said it increased the direct tax collection. 25% said it had no benefit at all. The data released by the Controller General of Accounts showed that direct tax collections grew by only 6.6% during April-July of the current financial year against the Budget target of 14.4 percent for 2018-19, painting not a very rosy picture. 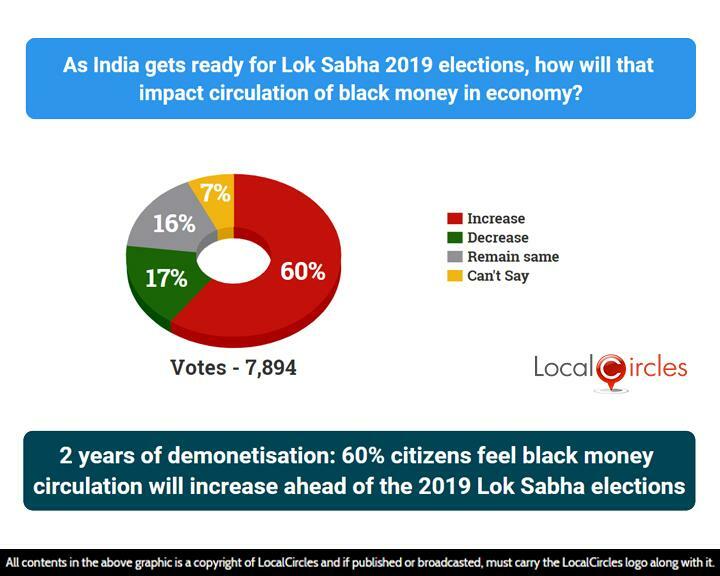 The last question asked as India is preparing for the 2019 Lok Sabha elections, how will it impact the circulation of black money in the economy. 60% said the circulation will increase and 17% said it will decrease. 16% felt it would remain the same while 7% were not sure about it. Government and more so the Election Commission will have to tighten the snooze on black money before the elections, otherwise the only benefit of demonetisation would be just the tax net expansion. 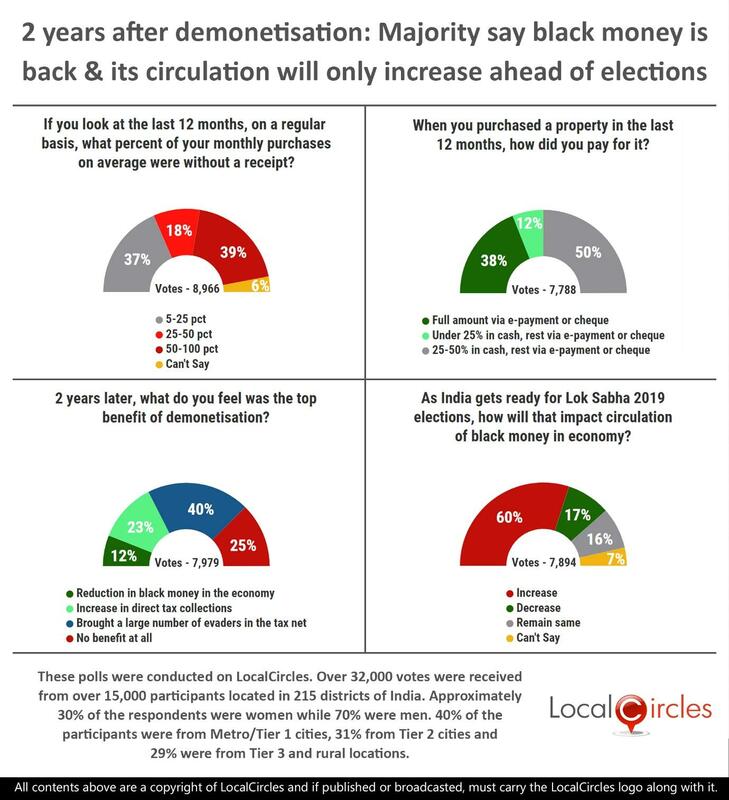 LocalCircles will be submitting the findings of this survey to the Election Commission, Ministry of Finance, RBI and other concerned departments. These polls were conducted on LocalCircles. 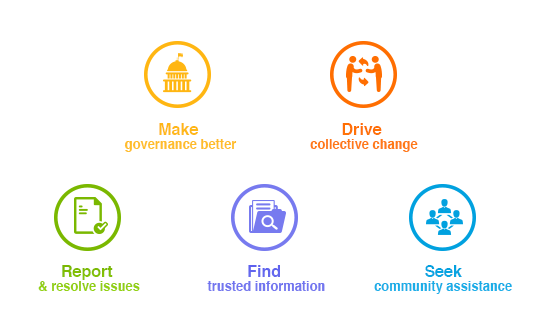 More than 32,000 votes were received from over 15,000 participants located in 215 districts of India. Approximately 30% of the respondents were women while 70% were men. 40% of the participants were from Metro/Tier 1 cities, 31% from Tier 2 cities and 29% were from Tier 3 and rural locations.